I’m Meghan. Like the authors of almost every food blog I follow, I have a day job that has nothing to do with food other than the fact that I eat lunch part way through the day. When I come home from work, making dinner is productive and relaxing. 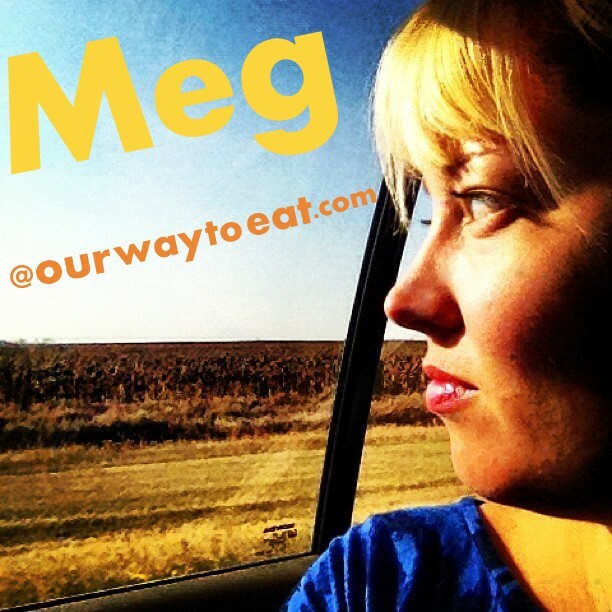 I blog because I love to cook and eat; and I have a lot to say about it. It is a creative outlet. I admit that I can’t make a sandwich without whipping out my camera. Eating is an essential daily activity that presents the opportunity for thoughtful appreciation and meaningful time with others, with only modest effort. Many of the most important and joyful moments of my life have taken place sitting at the dinner table. This includes learning the multiplication times tables at breakfast with my parents in grade 3, and the uncharacteristically quiet dinner I ate with Bjorn at Lula Café in Logan Square, Chicago right before he surprised me by proposing. I was raised on lovingly packed lunches and home cooked meals served morning and night by my Mother, Father, Grandmothers, Aunts and Cousins. Now that I have my own home, I find it energizing to plan and prepare a meal for us or for our friends and families. With farming roots in both of our families, we both have a natural inclination to know and appreciate the source of our food. In my childhood I enjoyed homegrown vegetables and produce from my Grandma’s garden and other local growers. Every summer my Grandma took turns spending a day with my Mom and each of my Aunts to butcher and freeze chickens that she raised, as well as corn and other vegetables. I spent many hours side-by-side with my Grandma in her garden and kitchen. When we bought our home in the fall of 2009, my first dream for our urban back yard was to start raising vegetables. I studied over the winter, and at the sage advice one of my best friends, we installed raised beds. In 2010 we raised 48 square feet of vegetables using the Square Foot method and expanded to 96 square feet of vegetables and herbs in 2011. I haven’t ruled out further expansion in years to come, but for now, 96 square feet is plenty of work and plenty of veggies for two people to grow and eat since we have limited free time on our hands. We are also enjoying getting to know our way around the Saint Paul Farmer’s Market. With the vegetables in our yard and great produce available at the Farmers’ Market, we have started preserving some food for the winter. We use beef raised by Bjorn’s Uncle whenever it is available to us. In addition to our interest in the source of our food, we both enjoy trying to make things from scratch. On the list of “from scratch” items that I have attempted or that we frequently make from includes bread, Grandma Johnson’s Buns and Caramel Rolls, Lefse, strawberry jam, pestos, (with a mortar and pestle), a variety of fresh pastas and fresh mozzarella cheese. Bjorn is almost always equally involved in my culinary adventures and in gardening. Bjorn is always game to bring home seafood that comes into the house from the fish monger in its natural form, and in the past year has become adept at making amazing chocolate desserts. This year, he’s already started brewing his first batch of beer, and he’s getting ready to start smoking meat and making charcuterie. As far as food preparation goes, I am conscious of our health and I strive to use whole, natural and responsible food sources, but I am not at all a perfectionist or a purist. I will write about Kraft Dinner in this blog, no apologies. I am a vegetarian, which presents opportunities to enjoy amazing vegetables and interesting proteins. It also presents a few challenges since my husband and most of my friends and family enjoy a healthy appetite for meat, and since I live in the Midwest where outside of urban centers, vegetarian options are still few and far between. I consider myself to be a “born vegetarian.” I come from a long line of meat eaters. My parents didn’t require me to clean my plate, so as soon as I was old enough (read: brave enough) to say “no” to meat, I stopped eating it. At home, I was brave enough to say “no” at an age when steak was cut up into tiny pieces for me on my plate. Out in the world, I became completely meat-free a little later. I recall participating in “hotdog day” in elementary school, and having hamburgers at someone’s birthday party. I really didn’t like them, but I like to be a part of things and I didn’t want to offend the cook. Since the time I totally quit meat, I have never missed it, and I’ve never been unhealthy for it, so I believe it is something my body doesn’t miss either. I think some people’s bodies are composed differently, and I don’t consider a meat-free diet to be a good diet for most people. I cook meat regularly for Bjorn, who is an omnivore, but not every day because he’s flexible and doesn’t expect or seem to need to eat meat with every meal. Our Way to Eat is a place for us to share what we have going on in our kitchen, occasional meals out and things we taste while traveling. We may include a recipe occasionally, but for the most part, we’ll be talking about the meals we make and our musings rather than providing a recipe, or a step-by-step “how to” cook something. There are wonderful resources all over the web, and in cookbooks, and we’re just figuring that out ourselves at the moment. We will cite our sources when we are inspired by something we’ve read or when we follow someone else’s recipe. Please come back now and then. If you like what you read you can “subscribe” by email so you don’t miss a single wordy, rambling post by me, or a more succinct post by Bjorn which should start appearing soon. All content and photographs are our own creation and property unless otherwise noted. We use a point-and-shoot Panosonic Lumix on the Food setting or the Action Setting most of the time. When I’m out and about sometimes I snap a shot on my TMobile G2X Mobile Phone with Google. We edit photos on Pixlr-o-Matic available on Google Chrome, and in Picasa. Hi Meghan, Just found your blog. Interesting. You enjoy preparing good-tasting and good-looking foods at home and enjoy trying to make things from scratch. We have a lot in common. I have very little free time, just like you, but yours comes in larger chunks and at eating time mine comes a few minutes here and a few minutes there and definitely not at dinner time! I do spend most of my free time in the kitchen however. I do love meat. I found it interesting to read that you never felt like you needed it. You can definitely be a healthy vegetarian with fresh eggs, good milk and cheese etc. The truth is that I know too many unhealthy vegetarians. I can tell you have a good approach to it. I strongly believe in ethically responsible food consumerism and definitely do not want to support CAFO meat, so I refuse to buy meat at the store. I just bought a quarter beef from a neighbor and raise my own meat chickens. Besides that we have 3 deer, ducks, fish, pheasants, grouse as well as elk and antelope in the freezer. I love eating wild.